In 1972, Bhagavan Baba conducted a month long Summer Course on Indian Culture and Spirituality at Brindavan, Whitefield. 800 boys and girls selected from colleges situated in all the various states of India were chosen for the camp. When Easwaramma, Bhagavan Baba's mother came to know about it, she desired to be there. She took up residence on the ground floor of Swami's bungalow with other families. On the eleventh or twelfth day of the camp, the Mother had an experience that reaffirmed her faith that Swami was God. She had high fever for four days and Swami visited her enquiring about her health. When she looked up she was amazed to see "Sri Rama with Kireetam and Kodandam" (Crown and Bow). She raised her folded hands and struggled to sit up. But in a few moments He became Swami again. He gave her Vibhuti Prasad and assured her of recovery from her fever. She shared the thrill of this encounter with an intimate friend. This divine revelation proved to be the prelude for her merger with the Paranjyoti (Supreme Flame). It was the 6th May 1972 about 7 in the morning. Students had already completed Nagar Sankeertan; Swami had given them a Darshan at its close. Then He went for His bath. Meanwhile, Easwaramma had finished her bath. She drank her coffee and was seated on the inner verandah. All of a sudden proceeding to the bathroom, she cried out, "Swami, Swami, Swami!" Bhagavan responded, "Coming, coming." Within that period she breathed her last. That was an authentic consummation, a yearning at the final moment for God. It was the sign of her holy purity. She was a model mother, chosen by God to be His mother. Easwaramma was a poor, middle-aged, tender-hearted, pious, illiterate rural housewife. When she was invested with the onerous responsibility to mother God Himself, she rose to the occasion and with steadfast courage enacted the role and encountered the challenges. She experienced all the grief and joy, hope and despair, anxiety and assurance of the mothers (Kausalya and Yasoda) of previous incarnations Rama and Krishna. Easwaramma, like every other Hindu housewife of her region was conversant with the Telegu ballads, legends, folk songs and tales that have gathered around Rama and Krishna. But, it took years of intimate observation and hundreds of inexplicable incidents and intimations to convince her that the child she had fondled had come to prove the Bhagavatha and the Ramayana as true. As mother of the Avatar she was venerated by all the devotees. But, she herself was an earnest sadhak guided by her Divine son through the tangles of life. She expanded in her awareness beyond the barricades of tradition and taboo, custom and caste of her people. She rose to be the universal mother of the fast multiplying multi-lingual, multi-racial, multi-credal, global family of Sai. May 6 for Sai devotees in Easwaramma Commemoration Day. On this auspicious occasion Bhagavan Baba visits His mother's Samadhi and makes obeisance to her memory, to set a model for others. In the evening He gives a discourse highlighting the glory of motherhood. He reminds people of the roles of Madalasa, Iswar Chandra's Mother, Putlibai and others in shaping the destiny of their children. 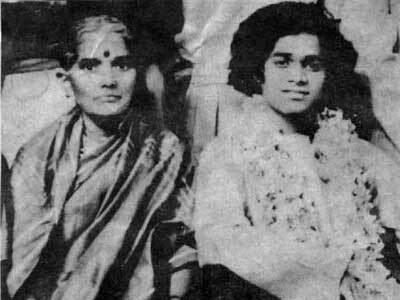 Mothers, Bhagavan says, have the unique privilege of instilling the first seeds of spirituality and human values in their children. Bhagavan lays equal emphasis on children revering their mothers. He reminds them of Rama's words, "Mother and motherland are greater than Heaven itself", and "Parents are the visible embodiments of God."